Cat beds offer a comfortable sleeping spot for your kitty. While a cat can fall asleep almost anywhere, providing a safe, comfortable sleeping place is part of good feline care. Below, we'll look at types of beds, where to place them, and where to buy. Cat sleep fact: Cats have two sleep phases that we know of; light sleep, which we know as "cat naps" and deep, or paradoxical sleep. Paradoxical sleep involves dreaming, with twitching and other body movements. During the first few weeks of their lives, kittens only experience deep sleep. 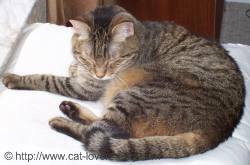 Cats typically prefer to make a bed in a sleeping spot that is either up high, or hidden in some way. They often prefer to be surrounded on at least two or three sides, and out of drafts. 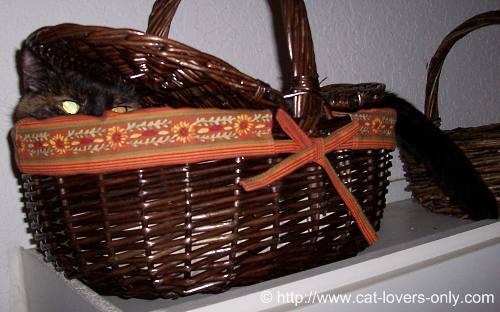 So, place your pet beds up high, in a basket, a corner, or some other hidden area. Your cat may enjoy sleeping in your bed as well, and some pillows or a doubled-over blanket may be just what she needs to be most comfy. Cats also enjoy heat, so much so they're like heat seeking missiles. They have actually been known to burn themselves or singe their fur on hot household items. As mentioned on the cat care tips page, they especially enjoy sleeping in the sun. Setting up a sleeping spot for your cat by the window also allows her to survey her territory and look for prey in between naps. Note: In colder climates, there may be significant cold air drafts near the windows. In those cases, you may want to use a heated bed or one with a high sides, such as the Cat-n-Round shown below. Beds, pads, blankets, and perches. What to choose? Heated beds, pads and blankets can satisfy your cat's need for some warmth. Some of these are electric, and others are self heating, simply using heat from your cat's body. 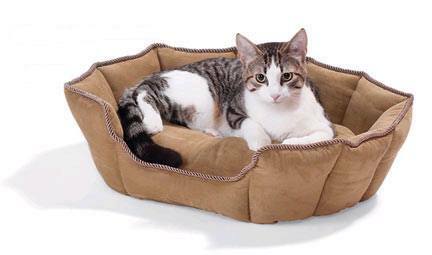 Covered or hidden beds allow your cat the feeling of cave-like safety. Pads and blankets are easy to travel with, and come heated or non-heated. Of course, there's nothing like a window seat. Cat perches are designed to be an easy way to allow your cat a perch by the window. Cat sleep fact: Cats may sleep up to 16 hours per day. Depending upon age, level of activity, current state of health, temperature, and so on, your cat may sleep more or less than this. Just because your cat is resting doesn't mean she's asleep, either. As your cat ages, she may sleep more and more, and seeking warmth may become more and more important. Below are some items from the folks at Catsplay. Cat sleep fact: Cats can, of course, sleep anytime and almost anywhere, sometimes in the most uncomfortable looking positions. Cat sleep fact: Cats return more quickly to a waking state than any other animal. In fact, their sense of hearing is actually heightened during sleep so they can be alerted to danger. Cat sleep fact: Cats spend about 60 percent of their lives sleeping. About one third of this time is spent in deep sleep.